Miss Serena Farnsworth, spinster, is a managing female, the general crutch for her extended family, for whom she functions as nurse, companion, and household organizer. In short, she lives a life of service, devoid of romance. Until she is invited to attend an invalid at a gloomy Gothic-style estate in Northumberland, where she encounters two suspicious deaths, personal animosity, a needy child, and even needier father. Add witchcraft, poison, shake (sink) holes, Mid-summer Eve revels, and a variety of odd characters, as well as the certainty someone is trying to kill her, and Serena finds herself surrounded by a miasma of evil. The lord of the manor should be of help, but he, alas, is a prime suspect in the murder of the BRIDES OF FALCONFELL. 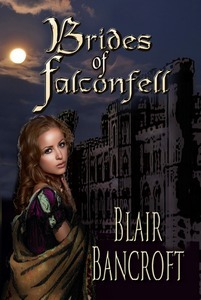 Author's Note: BRIDES OF FALCONFELL is a tribute to the great era of Gothic novels, written by Victoria Holt, Jane Aiken Hodge, Mary Stewart, Phyllis Whitney, and other talented authors of that time. The books-more Jane Eyre and Rebecca than Pride and Prejudice-have several common elements: they are told in first person, as both heroine and reader must be isolated, unable to know what the other characters are thinking. Frequently, the heroines are married and begin to suspect their husbands of murder. There is often a child, usually the hero's from a previous marriage. A large, gloomy mansion is a must, where murder, madness, and evil abound, with the heroine escaping death by the skin of her teeth. I have put all these conventions in BRIDES OF FALCONFELL and chosen an isolated location at the very "top" of England as a setting. I hope you will enjoy my personal attempt at "Gothic Revival."